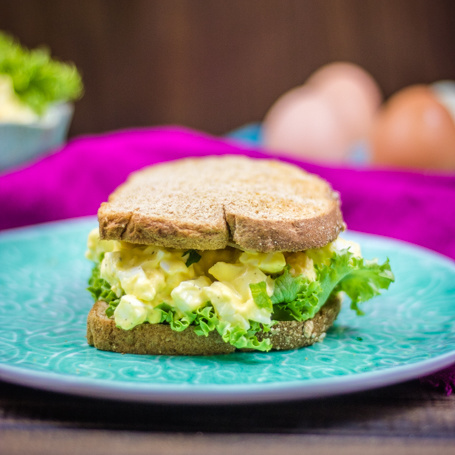 With Easter just around the corner, you’ll be looking for creative ways to use up all those hard-boiled eggs, and this Caesar Egg Salad Sandwich is just the variation you need! 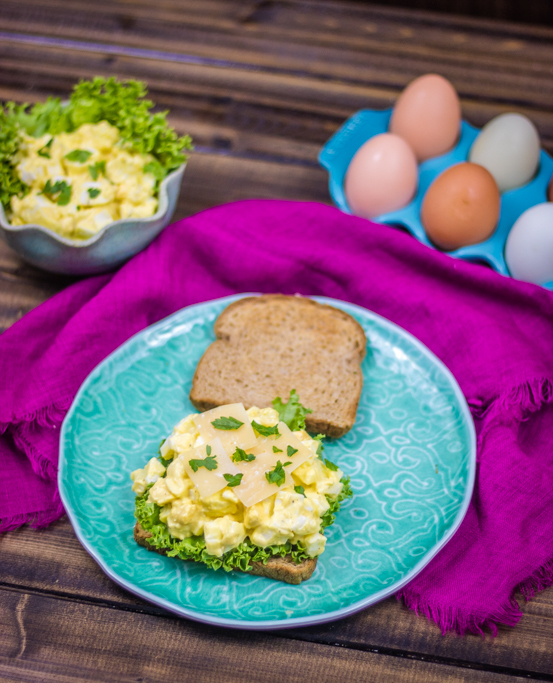 Egg salad is one of those things that I really love, but rarely think to make. I’ve recently perfected my hard-boiled egg method, so I can actually peel them cleanly and without taking chunks of the egg white with the shell. I felt super-accomplished once I realized it wasn’t a fluke that just happened once. It’s the little things, y’all. Natalie is at the age now where we will likely being the egg-dyeing tradition for Easter, and that means lots of hard-boiled eggs. Eggs that will need to be eaten fairly quickly. We love deviled eggs, but egg salad is such a great option, and Caesar salad egg salad is such a fun twist. My goal with this recipe was to use all the components of a Caesar salad in some way. 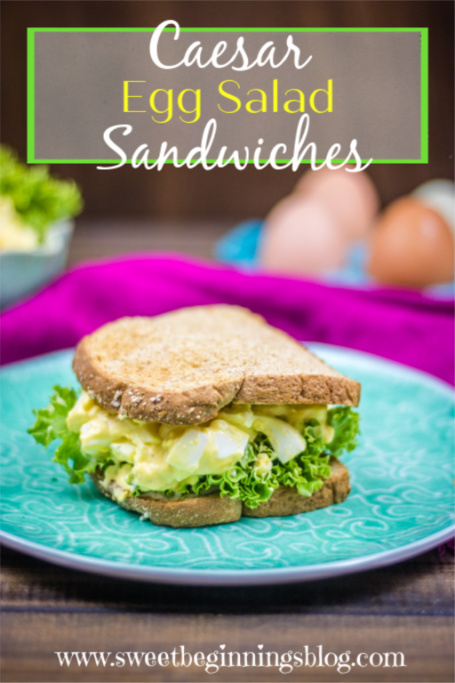 So, the lettuce, croutons, parmesan and dressing are all present in their own way and it makes for one delicious egg salad sandwich, let me tell you. You see, I made the egg salad my traditional way, and then I added the Caesar dressing and parmesan to amp it up. I tried it first with mostly just the dressing, and I found it to be too bland. Mustard is a key element in egg salad, my friends. You can quote me on that. Next on my list is to make these Caesar Deviled Eggs. And these Jalapeno Bacon Deviled Eggs remain a family favorite, for sure. Because, yum. How do you make hard-boiled eggs? 1 – Place eggs in a large pot and add enough water to just cover the tops. 2 – Heat over high heat until the water comes to a boil. 3 – Reduce heat to a slow boil and cook for 12 minutes. 4 – After 12 minutes, turn the heat off, but leave on the burner and allow to sit for an additional 10 minutes. 5 – Prepare a large bowl of ICE WATER – this is very important!! The bolw should be large enough for all the eggs to be fully submerged in the ice water, but don’t use larger than you need as you will then need a lot more ice to achieve the icy coldness that is required. 6 – Carefully remove the eggs from the pot and place into the ice water. 7 – Allow to sit and cool for about 10 minutes. 8 – To peel, gently tap the egg shell, all the way around, on the counter or cutting board and run under cold water as you gently peel the shell off. It should peel off easily and without taking chunks of egg white with it. 9 – Repeat until all eggs are peeled. Rinse the eggs to be sure there are no shell remnants left, and move to the cutting board to chop up! And then, to make it into Caesar egg salad, you add Caesar dressing and freshly grated parmesan. 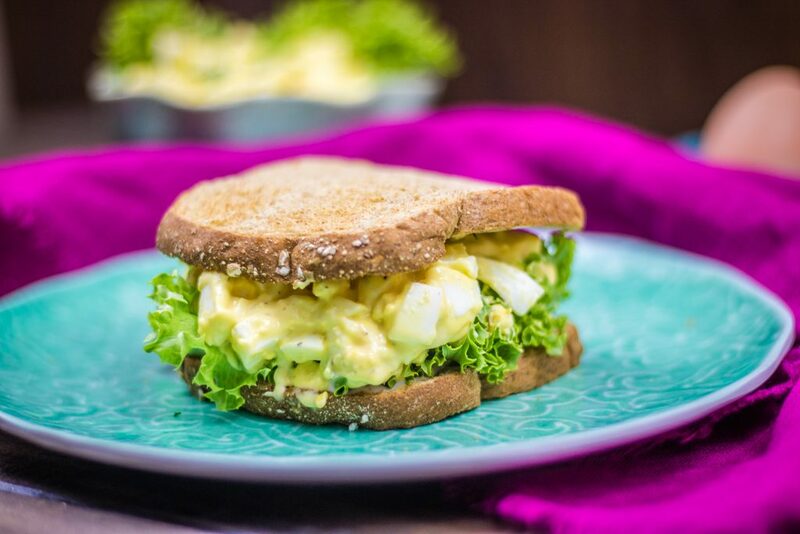 Toast up some bread, add some crisp green lettuce, and you have yourself a Caesar egg salad sandwich. Roughly chop all the eggs and place in a large glass bowl. Add the mayo, Caesar dressing, mustard, vinegar, Parmesan, salt and pepper and stir gently to combine. Taste and add additional salt and pepper if desired. 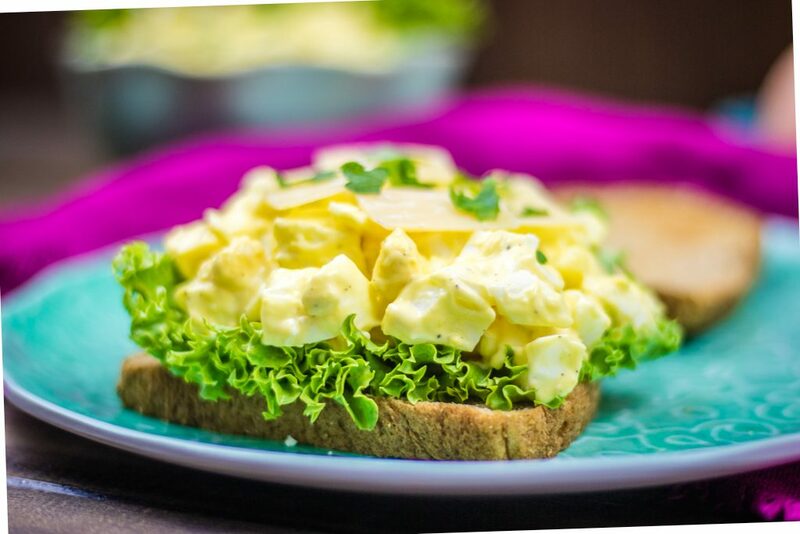 Toast bread, top each of 4 slices with a lettuce leaf then a generous helping of the egg salad, and then the remainig 4 slices of toasted bread. I like to put some Caesar dressing on my toasted bread slices as well, so it doesn’t seem to dry – that is optional depending on your preference. Slice your sandwiches, if that’s how you roll, and enjoy!